Yesterday was the kind of blustery, billowy day that gets your washing dry in no time. And hanging sheets on the washing line in Spring is glorious! Our washing line is surrounded by garden beds, and at this time of year the sweet peas, alyssum, poppies and jasmine all look and smell divine. And don’t even get me started on the strawberries and blueberries. There’s something wonderful about collecting the washing and picking a few blooms or some fresh berries at the same time! So after changing the bed sheets yesterday, the weather and the garden inspired me to get creative. 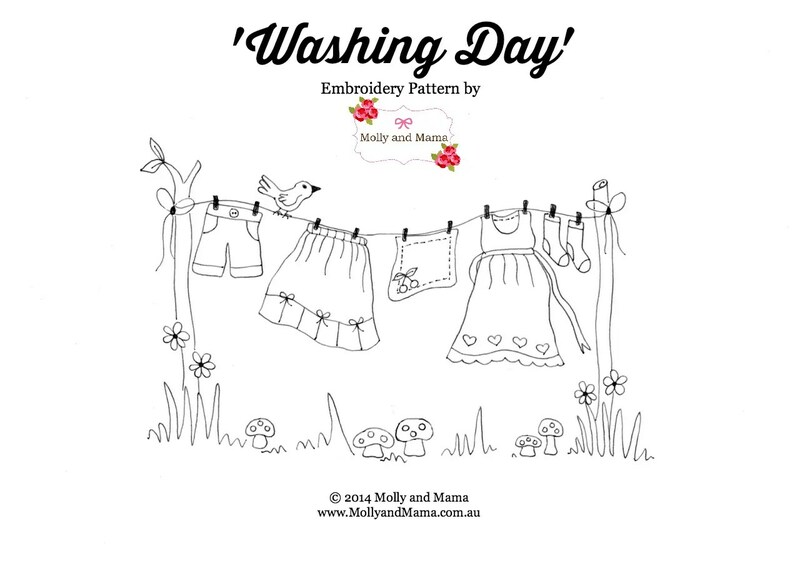 I made a beautiful Pinterest board titled Laundry Day and added some divinely inspiring images. I love Pinterest for that! The board will continue to grow with pretty ideas and inspiration (along with all the rest of them). Then I grabbed a notebook and penned a quick sketch that really captured my feelings about laundry day. I only wish all my washing would fit on a pretty line between two trees! I realised the sketch would make a pretty embroidery, so I’ll be adding this project to my ever-increasing ‘to do’ list. And I hope to create a tutorial about it too. If you manage to complete it before me, I’d LOVE to see your work. Perhaps I could feature it on the blog? Please email me a photo or share it on the Molly and Mama facebook page. Feel free to download the embroidery pattern HERE. It’s a freebie from me to you, for personal use only. Thank you for the cute embroidery pattern. Love it! You’re very welcome. Happy stitching!